Ms. Rosa Magdalene Rowe, 55, of 314 Apt. 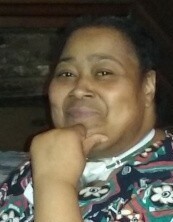 E, Green Street, Wilson, NC, passed away on Friday, March 22, 2019 at her home. A public visitation will be held on Wednesday, April 3, 2019 from 4:00 pm until 7:00 pm also at Stevens Funeral Home. The family will receive friends at the home where they will assemble on Thursday at 10:00 am in preparation for the funeral procession. "God is our refuge and strength, an ever-lasting help in trouble"